They're here! 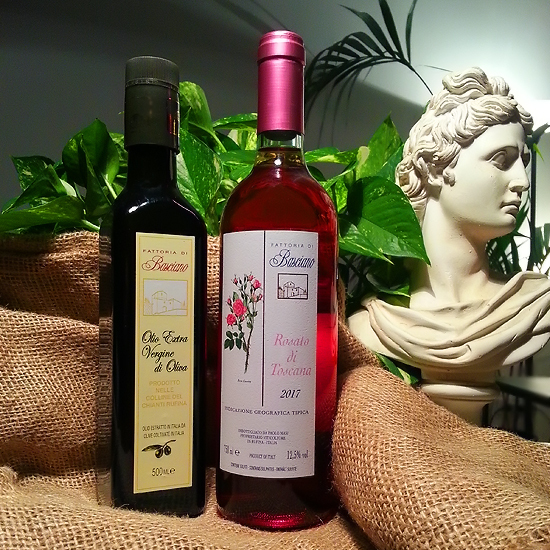 New Oil and Tuscany Rosé 2017 are finally on sale! Yellow-gold colour, with clear green reflections. Intense and very fruity perfume (as just-picked olive). At the taste intense and very well structured, it is slightly aggressive in its youth, but gains grace and softness after a few months. It is obtained in the 20 ha of oliveyard of the Fattoria. High quality and long preserving product, it gives its best after a few months. Salmon-pink colour. Intense and rich nose, with typical fruit and flower flavour, with notes of wild strawberry. On the palate, it is medium-bodied, with lively acidity and good softness, exalted by a light residual sugar. It is obtained by 100% Sangiovese grapes, by setting some of the must apart in the very first hours of maceration, as soon as it has absorbed a pinky colouring. Our Rosato is a fresh, fruity wine with marked floral perfumes, and nevertheless concentrated and consistent.